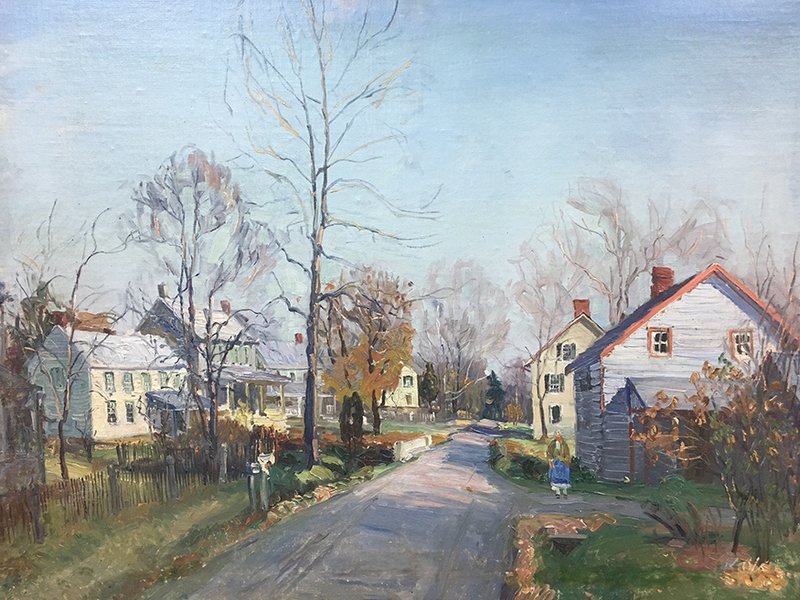 Walter Emerson Baum, born in Sellersville, Pennsylvania in 1884, is the only New Hope Impressionists actually born in Bucks County. Widely celebrated for his Impressionist snow scenes in the tradition of Edward Redfield and Walter Schofield, his style was bold and painterly. Many of his canvases were painted using the plein-air style. Baum captured the now largely developed Pennsylvania countryside and farmland. He also depicted the charm of Main Street America as it once was. He was an extremely prolific painter and today his works are among the most sought-after paintings in the New Hope Impressionist School. Baum attended the Pennsylvania Academy of the Fine Arts from 1905 to 1906. He was awarded over thirty prizes and awards from 1918 to 1957, including the Jennie Sesnan Gold Medal at the PAFA in 1925. 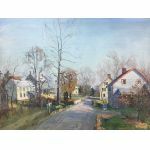 Not only revered as a fine painter, Baum was a writer for the Sellersville Herald and the Philadelphia Evening Bulletin, where he was an art editor and wrote hundreds of newspaper articles in his career. Baum was a major force in the Lehigh Valley art world, as a teacher and a founder of the Allentown Art Museum and the Baum School of Art. Today his paintings hang in many major museums, including the Michener Art Museum, PAFA, Philadelphia Museum of Art, National Academy of Design, the Allentown Art Museum and Woodmere Art Museum. Baum's impact on the arts extended far beyond just his paintings or his writings. He offered art classes at his home for almost ten years between 1918 and 1926. In 1926, he began offering summer classes in Allentown. Within two years, he established the Kline-Baum school (later renamed to the Baum School of Art). Walter Emerson Baum died, where he was born, in 1956.